Released in 1986 Sorority House Massacre came out at a time when even the most die-hard of slasher fans have to admit that these films were starting to lack compared to the early 80s and this movie does nothing to change that notion. 1981 was to me the Golden year for the slasher flick, but even after that there were still many solid slasher movies released, but by the mid-80s these films were clearly on the decline as everything that could be explored was and many slasher flicks started to either be comedic or played light meant to simply entertain instead of any suspense or tension with absurd deaths and this gave these films a little more time, but by the end of the 80s the slasher flick was all, but dead. Stop me if you’ve heard this before; A killer (Russell) escapes from an insane asylum and returns home to kill his sister Beth (O’Neill). Sorority House Massacre clearly lifts plot points from Halloween and Halloween II and even has a touch of A Nightmare on Elm Street as well. Oh and the killer also drives a station wagon that he has stolen. The one thing that is quite clear is writer/director Carol Frank really enjoyed the first two Halloween flicks as she takes elements at every turn from not only the plot, but even the visual look; there is a scene when the killer exits his car, which was a shot taken right out of John Carpenter’s Halloween, but while Carol Frank clearly liked Halloween the one thing I can say for sure is she clearly learned nothing from watching John Carpenter’s classic. The only difference between this and the first 2 Halloween flicks is instead of the killer simply murdering his sister and then goes after the other one he kills his whole family except for his younger sister who managed to get away; oh and did I mention that Beth’s birth name in the movie is actually Laura? Not much of a difference from Laurie now is it? The one thing that sort of bothers me is people are too willing to accept trash with reasons listed as it’s a slasher flick what were you expecting? I don’t think anyone goes into slasher flicks looking for great writing, directing and acting, but that isn’t an excuse to deliver such poor work. I’m not expecting slasher flicks to be on the same level of Taxi Driver, but there is no reason why these movies can’t be well-made. 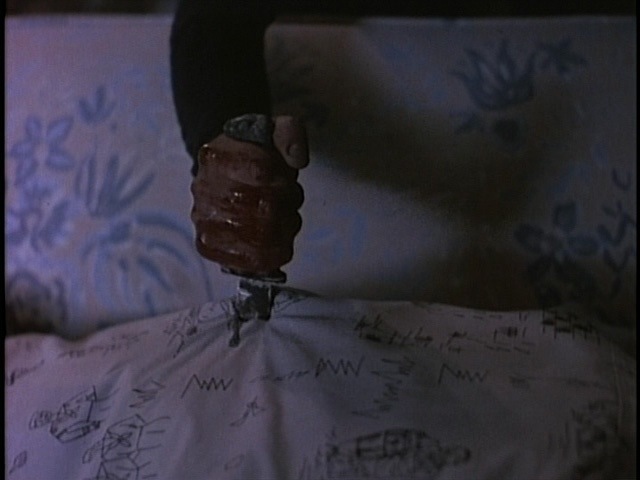 Quite honestly I think many 70s/80s slasher flicks were fairly well-made with some being very well made like Halloween and Black Christmas, which have great production values for such low budget movies. I can tolerate weak filmmaking in slasher flicks if the movie is fun at least and maybe even a little creepy since there were a few slasher flicks in the 80s that while not well made did manage to have an eerie tone, but sadly Sorority House Massacre fails at everything it attempts. Carol Frank makes her writing and directing debut and previously, she worked as an assistant to the director on The Slumber Party Massacre and a production assistant on a movie called Summperspell. The script by Carol Frank was terrible filled with faceless victims; you’ll be hard pressed to remember anybody’s name. Slasher flicks often have weak characters, but this movie has characters that are so faceless and none of them have any identity. I think the original Friday the 13th is a good example of disposable characters, but they each however have their own identity and even add to the movie so you don’t need to write really deep and complex characters for to have some depth. The characters here are boring and lifeless and even though the acting wasn’t horrible they all sleepwalk through their performances. Carol Frank is content with simply knocking off Halloween and A Nightmare on Elm Street and any ideas added are poorly executed. Carol Frank attempts at adding a more psychological approach as Beth has blocked out what happened to her when she was a child. Some people question movies that have done this, but it is fairly common for people to block out traumatic events from their childhood and Carol Frank tries to make this deep and complex, but it comes out laughable due to how poorly written it was. The way Beth is able to remember is from her sorority sisters, they hypnotize her to bring out what she’s blocked and it’s just so absurd that I didn’t know if I should laugh or roll my eyes at the idiocy of the scene. Sadly as director Carol Frank doesn’t fare any better; Sorority House Massacre only runs at about 74-minutes and has about 10 or so deaths, but everything is paced so horribly the movie feels a lot longer and it doesn’t feel like that many people are killed. It’s amazing that the movie has such a short running time with so many deaths and yet Frank still manages to bore the viewer. As I stated Carol Frank clearly follows what John Carpenter did with Halloween, but it seemed she didn’t learn how to craft a well-made movie. The budget was quite low and sometimes that can hinder a movie, but I’ve seen many horror flicks and films in general that were produced on a very low budget and look as good as any Hollywood blockbuster and it’s not like this type of film needs a big budget. The direction is sloppy and boring with no sense of pacing and Carol Frank has no idea how to execute even a tiny bit of suspense. I always try to find something positive since making a movie isn’t easy and I’m sure Carol Frank tried to make the best flick she could, but I really can’t think of anything in this movie that worked. Despite how horrible Sorority House Massacre turned out I can’t say I fully hated the movie since it’s such a hack job you cannot totally hate the movie. Some have dubbed this one the worst slasher flick of the 80s and it’s quite hard to defend the movie from such accusations, but despite how bad this one was I don’t think it was the worst, but I could see this on a bottom 10 however. I think even the most loyal of slasher fans probably won’t see this movie much different than I did and while the movie is horrible like I said it’s hard to totally hate since it’s such a hack job.